Wooden Structures of Liao Dynasty - Wooden Pagoda of Yingxian County, Main Hall of Fengguo Monastery of Yixian County is part of the Tentative list of China in order to qualify for inclusion in the World Heritage List. 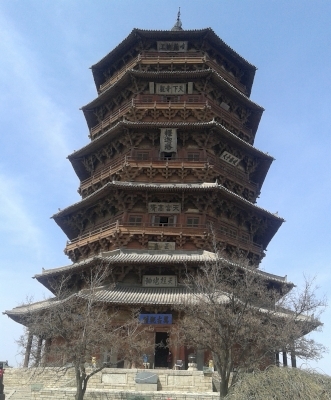 I visited the "Wooden Pagoda of Yingxian County" on a day trip to Yungang Grottoes starting from Datong. I know this seems like the opposite side of town but the morning is spent visiting the Hanging Temple in the south and then you only reach the northern grottoes in the afternoon. According to my photo timestamps we stopped here at 2pm. The tour guide told us we would normally only see this on a two-day trip but I am not so sure this is really true - yet some people changed bus so this seems to be some kind of meeting points for the tour organizers to exchange tourists going to different places. The name of the tower says "釋迦塔" but after some quick check the Wikipedia entry calls it the "The Sakyamuni Pagoda of Fogong Temple". It claims to be the oldest wooden pagoda built in 1056. I strongly doubt all the inside parts of the pagoda are that old but the outer wooden section surely could. The inner statues are not that special but apparently they contained a few very important artifacts - not entirely related to listing the pagoda as WS though. I think this masterpiece of craftsmanship would do well on the WH list. If somebody can built a tower that lasted 1,000 years and MAINLY had to be repaired due to Japanese bullet fires I have to respect that. I haven't visited the hall in Yixian yet. I didn't know this was the same tower until I opened up the page here because the guide just told us the name was "Muta". When I visited in April 2015 there was no way to reach the upper areas so I could only admire it by walking around. (Let's leave it at that please and no silly elevators like Wuhan's Yellow Crane Tower.) The areas surrounding the tower are almost like a wasteland so your focus will be on the tower anyway. As it was not a main stop of the tour the bus only stopped for maybe 30 minutes but that was enough to enjoy it.